Was there a need for another book to speak Italian better and better? | Speak Italian Magically! « If you think you can’t do it, hold on a moment, then do something else to improve your Italian! Was there a need for another book to speak Italian better and better? Was there a need for me to write another book to help you acquire the Italian language? Why am I asking myself and you this question? And why am I saying “was there a need” and not “is there a need”? Because I did it again! I wrote another book about this subject, a subject that is accompanying my life since 2003, when - without any preparation - I gave my first Italian lesson to Kathryn, an American student. Since that moment, I started a path of discoveries and findings, that from time to time led me to put in writing what I had learned. This time I started where I had left in the book “The secrets of the Italian Language”… Not exactly, because it was for me a good opportunity to systematize and “express” my discoveries and experiences in written (and audio) format. So, I started again from motivation, not because I am able to motivate you to speak Italian very well, but because I really think that you need to be really motivated from the inside to keep on improving with this wonderful language - Italian! So, I took (almost) everything that I know and I put it in the first part of the new book. What’s the title of the book? I wanted to title it “Gli altri segreti della lingua italiana per stranieri - The other secrets of the Italian language”, but the Englishwoman - grazie Alison! - who revised the English part of it, told me that “More secrets of the Italian language” would sound much better. And I followed her advice. In the second part of the book you are going to find practical lessons to help you absorb Italian with your whole brain. I am going to use two methods to help you do that. The first one is the TPR method. Basically I’ll tell you to take some actions and you are supposed to act them out. Why? Because if you use your body while listening to Italian, you’ll internalize and really absorb it. And then I’ll help you speak wit the TPRS method (Teaching proficiency through reading and storytelling). With this method I’ll tell you some stories from several points of view so that you’ll internalize grammar as well. And in the bonus page of the book you’ll find a lot of easy questions (in audio format) about these stories and you are supposed to answer these questions as fast as you can so that through repetitions you’ll automatize the answers and speaking Italian very well will became for you automatic . Then I’ll tell you about shadowing as well and the three ways I suggest you practice it. In the third part I’ll be very explicit about 4 grammar points that I haven’t written about in the first volume of the series… I’ll tell you about the differences between imperfetto and passato prossimo so that you finally manage to absorb the proper use of them… I’ll tell you about the imperative mood and how to use it; and then the similarities between futuro and condizionale as far as their structure is concerned. Last but not least you will find what I call la ciliegina sulla torta (the icing on the cake- in Italian we say the cherry on the cake) . What on earth could this be? You can speak Italian better and better and my goal is to help you realize that! So, Was there a need for me to write another book to help you acquire the Italian language? I’ll let you judge that on your own, perhaps by writing your own review on the website you’ll purchase it. I’ll be honored and grateful to read that. I wish you all the best in your learning path of the Italian language and anything else you are going to learn in your life because learning is wonderful. Learning, using, and acting upon what you learn is something really enjoyable, fun, wonderful because it’ll help you grow as a person and achieve all the things you are supposed to achieve in your life. So, Relax and enjoy your journey! ***Multimedia preview: get inside the book! *** Podcast: with weekly readings from the book! *** Maps and drawings from the book! P.s. 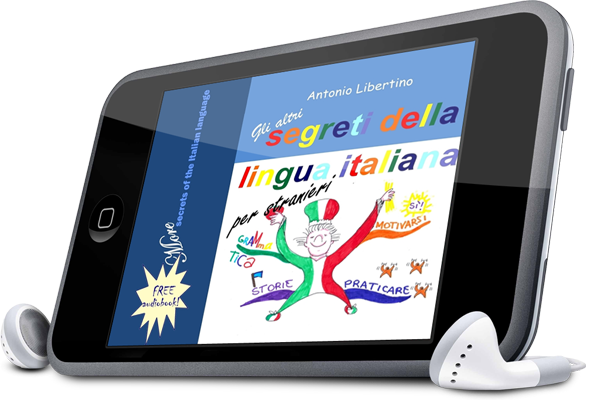 : Gli altri segreti della lingua italiana - More secrets of the Italian language is already available on most online bookstores... There are three versions: full color paperback edition, black and white paperback edition, and eBook edition. The first two options will let you get into a parallel reading experience. The eBook version will let you have a sequential reading experience - to keep compatibility with most reading devices. P.s. 2: Share this article as much as you like it! Grazie mille!!! P.s.3: If you think you won’t use it, please don’t buy it!!!! Questo articolo è stato pubblicato in 16 ottobre 2014 alle 14:22	ed è archiviato in Promotional. Tagged: audio book, bilingual book, learning italian, new book, speak italian very well. Puoi seguire qualsiasi replica a questa discussione tramite il RSS 2.0 feed. Puoi lascia un commento, oppure trackback dal tuo sito.